You really have made me the confident woman I once was. 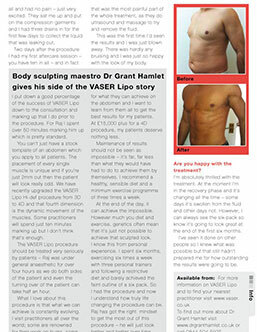 After reading up on Vaser liposuction it immediately had my attention. I had been un happy with my appearance ever since having children. I am naturally an active person but found after my last child I just couldn’t pull my body back to how it was. I did a lot of research and came across Doctor Hamlets name on more than one occasion. I went on to youtube listened to some of his conferences and immediately booked an appointment. Grant explained to me exactly what I could and couldn’t achieve. That’s one of many pluses with him. If he can’t make a difference he will not do the surgery. 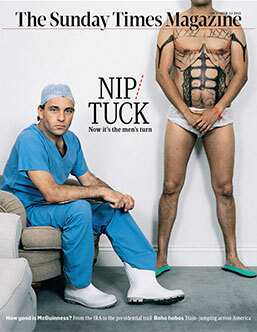 I was told initially from another surgeon I would need a tummy tuck. This was certainly not the case. After my first consultation I was just amazed. To meet someone with such passion about what he does the knowledge he holds and drive wasn’t expected at all. Looking at some before and after photos of his work was just incredible and a real eye opener to what this man could really do. I didn’t have to think I booked in immediately and waited for the big day. Grant and his team where fantastic from the minute I stepped in to the hospital. The after care has been fabulous. More to the point my body after the surgery was beyond what I expected (and I have big expectations Haaa !!) my stomach looks better than it ever has before I just could not believe it. My buttocks finally had shape instead of been long and flat and my thighs had the definition I have always longed for. I was that impressed I even booked in for round two and had the outer parts of my legs done. Grant thank you so much for making me like my body again. You really have made me the confident woman I once was. I am so happy to have my body back! 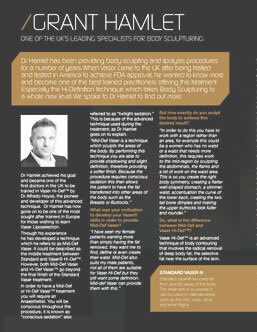 After a lot of research into the results of different Vaser Lipo surgeons, I decided to go with Dr Hamlet as it was clear that he achieves superior results. I am pleased to say that I am so happy with my body shape – the change was immediately apparent and I have been told that it will get even better once the swelling goes down! Grant is the best for Vaser by far. I have had my surgery with Grant in February 2016 and I never looked back. from the first consultation, I felt he was the right choice after I had visited few doctors which were cheaper, but please don’t look at saving few pounds. Go with the best one, at the end of day this is your body and Grant is the best for Vaser by far. The results after 6 months are absolutely amazing he change my life and my confidence, I’m so happy and confident in my bikini I cannot thank him enough. 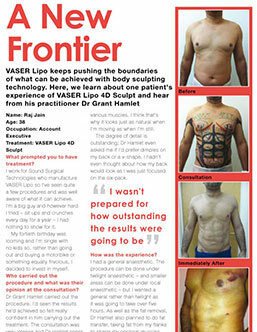 I have had Vaser to my whole body, it was a heavy operation but he was all worth it. He was there for me before and after when I woke up, I really felt at ease and take care of really well. Thanks you so much to Grant and Raddy for a life changing procedure! I could not be more satisfied with the treatment. From the very first consultation Dr Hamlet made me feel at ease and gave me a thorough and honest explanation of the procedure with zero pressure. I could not be more satisfied with the treatment I’ve received and am absolutely delighted with the results. Dr Hamlet and his team have been incredibly supportive throughout and I could not recommend it enough. I now feel confident in myself and am looking forward to wearing a bikini this summer! I can’t say enough about how good it is. 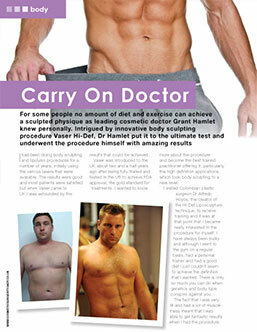 It’s the best thing anyone could get done if there not happy with their body, I was unsure about getting it done and went with a friend, I’ve trained since I was 15 years old and could never get nowhere near the result Dr Hamlet give me, it’s change my body no one can believe the difference in it, I’d recommend any one to get it done I can’t say enough about how good it is and Dr Hamlet it definitely the person to do it. A truly skilled Dr who will do wonders for you. I had high hopes for my own outcome after meeting Dr Hamlet and seeing his previous work, but the actual results far surpassed what I thought was possible. My life has been transformed and I can’t thank Dr Hamlet enough for his amazing work. No longer do I feel self-conscious about my bulge and I no longer have to make the effort to hold my stomach in all the time. I can reassure anyone considering this procedure that they are in safe hands by a truly skilled Dr who will do wonders for you. My results are fantastic and I could not be happier. I cannot recommend Dr Hamlet enough! From the moment I saw him for my first consultation, during my surgery and throughout the aftercare he has been fantastic and made me feel totally at ease. My results are fantastic and I could not be happier. He is an expert when it comes to Vaser and a true artist! Thank You!